corelib is a library that ships with KnightOS by default. It gives you all the things you need to integrate with the KnightOS userspace, such as GUI support and app switching. We’re going to bring in corelib as a dependency of our project, wrap our message in a window, implement user input, and add support for switching to other apps while ours is placed into the background. Note: As we extend the files in our project, this tutorial uses a "diff" to show the difference in each step. Lines that begin with + (in green) are lines added, and lines that begin with - (in red) are lines removed. This downloads corelib, installs it to your working directory, and adds it to your package.config file as a dependency. You can use --site-only, by the way, to download and install packages without adding them to your package.config file. We’ll show you how that’s useful at the end of this tutorial. Now that we have corelib loaded into memory, we can start to use the functions provided by it. One of these functions will draw a window in our screen buffer. Let’s modify our code so that the “Hello world!” message has a nice window around it. To draw a window, we use draw_window(SCREEN* screen, char *title, char flag), which is defined in the corelib header file that we added earlier. Don’t worry about the flags for now — we’ll go over those later. Now that we have a window, we have two icons on the left and right. In most KnightOS programs, tapping F1 (or Y=) will take you to the Castle, and F5 will take you to the application switcher. Kernel panic! This happens because when corelib switches away from your application, it suspends it to save on CPU time so that the applications that the user is currently working with can run faster. 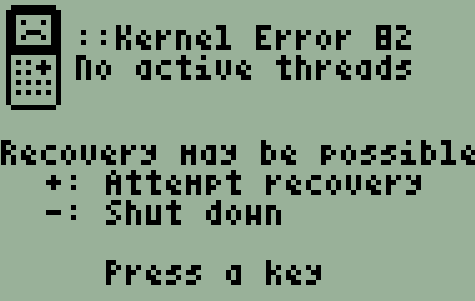 The kernel will panic if there every running thread is suspended, because that means that nothing can interact with the user. But why would that error happen here? The answer is simple - there is no launcher, and there is no application switcher! The KnightOS SDK sets you up with the most minimal environment possible, and that does not include the launcher or app switcher unless you need it. This installs the castle and threadlist packages, which are the default launcher and app switcher on KnightOS. The --site-only flag prevents them from being added as a dependency in your package.config, but just installs them for you to test with. If you run it now and press F1, you’ll be taken to the castle (which is empty because we haven’t configured it with any apps). Press F5 to go to the app switcher, which should list your app. Press enter here to return to your app. Note: .knightos/pkgroot is a directory used by the KnightOS SDK. The contents of this directory are the contents of the filesystem on the emulated calculator when you debug your app. Try installing extra/fileman and running it from the castle to explore this filesystem! Here are a few ideas for extending this program. Look at the corelib header and find out what the “window flags” are.